Like many old Rafflesians, I am proud of the fact that I was a student (from 1954-1959) and, later, a teacher (from 1964 to 1968) in Singapore’s oldest school known as Raffles Institution (RI). RI was founded in 1823. 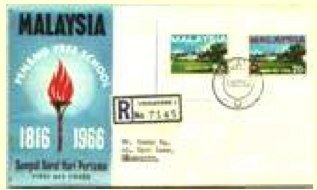 Although it is the oldest school in Singapore, it has not been featured on a Singapore stamp. Once in a while I meet someone who says, “I come from a school older than yours. And there are stamps of our school”. The older school is the Penang Free School, founded in 1816. Old ‘Frees’ should be delighted that their old school has a special philatelic issue (Stamps and First Day Cover) commemorating its 150th anniversary.